The scortching temperatures continue to turn UK into dessert-like land, so I’m coming to the rescue with another no-bake summer dessert, which is ideal for these days, when turning the oven seems like a sign of madness! 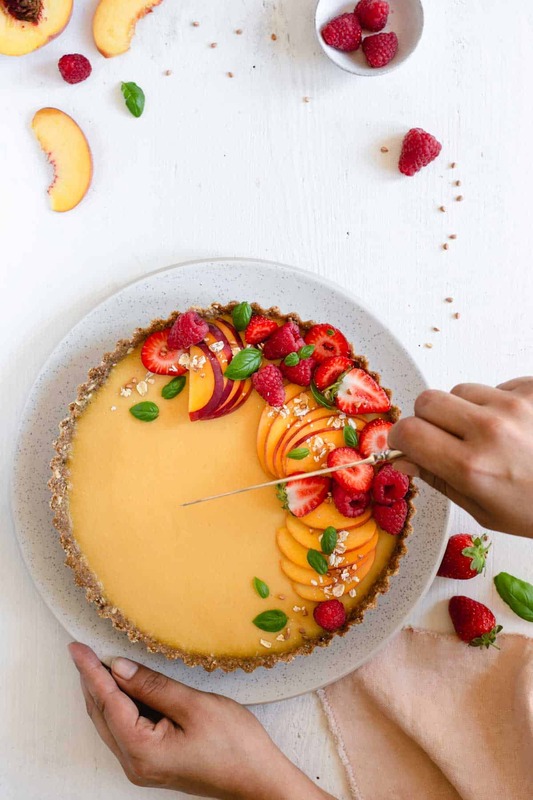 This incredibly easy recipe for vegan peach tart was adapted from super-talented Mei from nm_meiyee, and you can see the original here. As soon as I saw it, I feel in love with it, and I knew I will be making one in a very near future, which was the next day. My styling in today’s recipe, is also inspired by the one from Mei’s recipe. 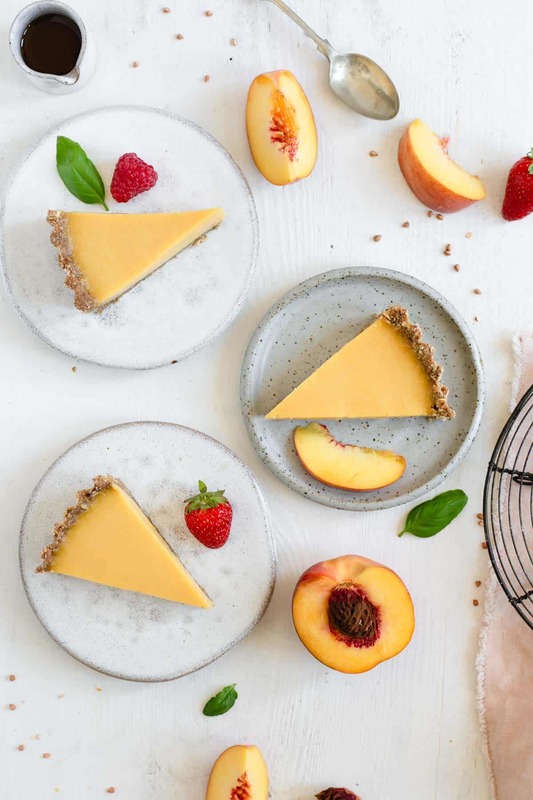 Summer peach tart- your ultimate Summer treat! Peaches are in season now, and to me, they are like an essence of the summer. Even their colour looks and feels like summer, not to mention how sweet and juicy they are at this time of the year. Also, they are so easy to work with, and can be added to pretty much any summer meal, or drink (Bellini, anyone?). 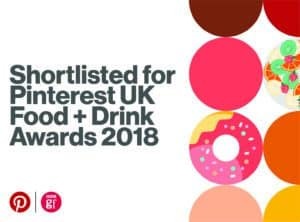 Salads, sauces, desserts, cocktails…the list goes on. If you would ask me what Summer tastes and smells like, I will definitely answer ‘peaches’! 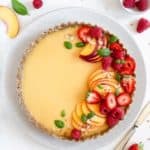 How to make Summer peach tart? It’s a super easy recipe, and the best part of it is that it’s a no-bake! On top of that, this recipe is vegan, gluten-free and refined sugar-free! The crust for the tart is made from gluten-free oats, some buckwheat groats, cashews and dates. There is a small amount of maple syrup and coconut oil added, just to bond the ingredients together. You just start with blending all of these together, until your mixture resembles medium breadcrumbs, or it has wet sand-like appearance, then transfer it to the prepared tin. The process of preparing the filling couldn’t be easier too! 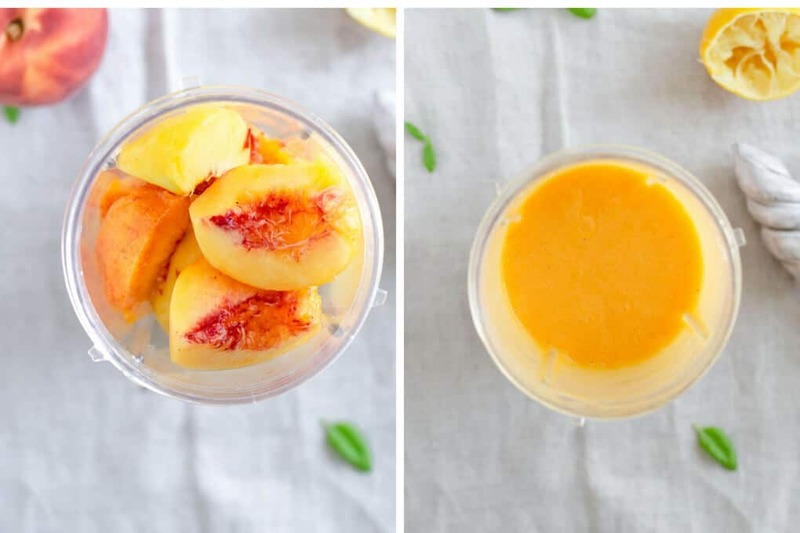 Start with peeling your peaches (if they super ripe, the skin should come off quite easily), cutting them into smaller pieces and blending with lemon juice until you have a smooth puree. After that, you just mix it with coconut milk (full fat one is recommended, as it will result in firmer and denser texture) and maple syrup. At the end, add the agar powder and arrowroot (or cornstarch) to thicken it all up, strain the mixture to a small bowl and pour into prepared base/ crust. Allow to set in the fridge for minimum of 4-5 hours, ideally overnight. Job done!!! Impress your guests with this easy peach tart! Once again, with no-bake dessert, the hardest art is to wait for it to set, but t’s definitely worth the wait! Just like my Raspberry Cheesecake recipe, you can prepare this one a day ahead and leave it in the fridge overnight. All what’s left to do the next day, is to decorate it with fresh fruit. 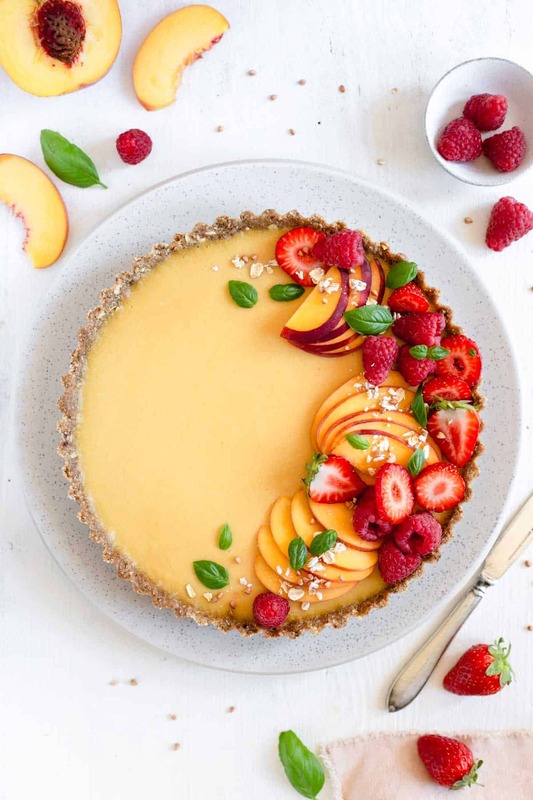 It’s lovely, vibrant colour along with beautiful, fresh summer berries, velvety smooth filling and healthy crust with just right amount of sweetness will guarantee to impress even the non-vegan guests! Thanks for reading today’s post, and as always, leave me a comment below if you have any thoughts about this recipe! Peel the peaches and cut into smaller pieces. Place them together with the lemon juice in a food processor and blitz until smooth. Pour the coconut milk into a medium saucepan, then add peach puree and maple syrup and stir together. Add arrowroot powder and agar powder and keep stirring until both have completely dissolved. Bring to boil and allow to cook for approx. 1 minute. Remove from the heat. Using a metal sieve, strain the filling mixture into a small bowl, then transfer it to the tart base. Place in the fridge for at least 4 hours or overnight. 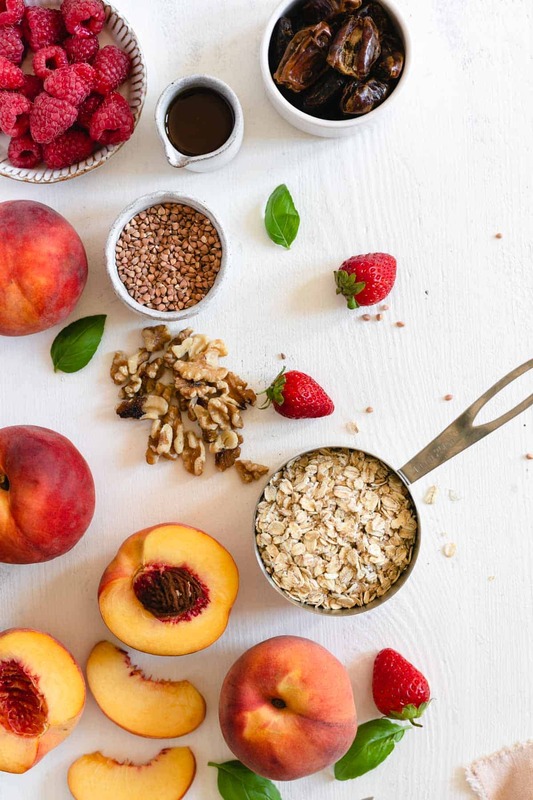 Decorate with fresh peach slices, raspberries and strawberries. Enjoy! 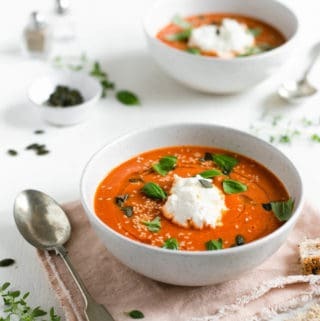 If you enjoyed reading this post and the recipe, why not subscribe to my mailing list, so you can be the first one to know when the new one is published! This is so gorgeous Anna! Such a pretty tart! This is such a pretty summer tart Anna. Love everything about this. That peachy color is so gorgeous. I have to make this one as soon as I reach home. What a beautiful looking dessert! I love gluten free, dairy free and refined sugar free desserts, so can’t wait to try this! Hey Vanessa! 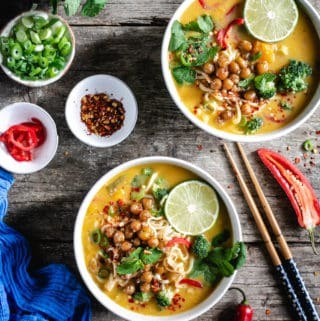 Over the moon to hear you like this recipe and you will be making it! 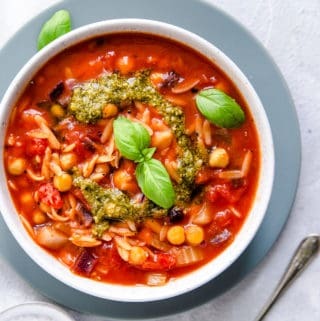 It’s a quick and easy one, but tastes incredible! 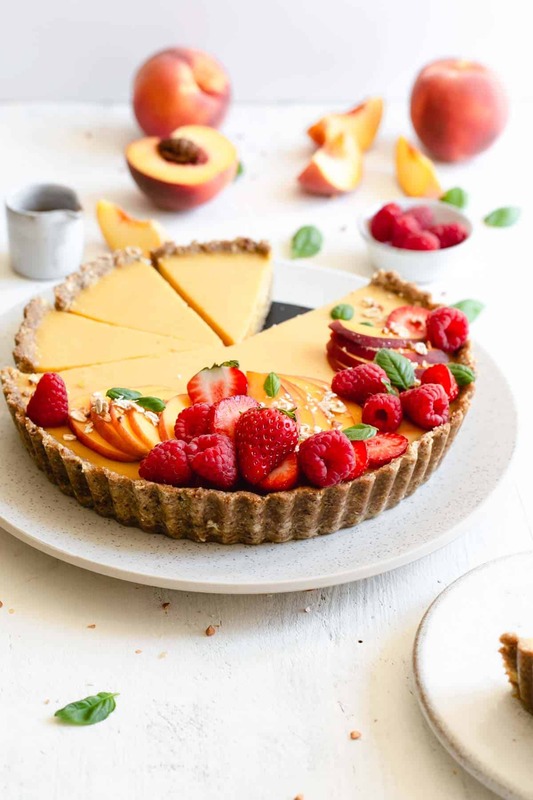 This is such a beautiful summer peach tart! I would seriously buy it! I love the use of rolled oats here. I’ve been trying to incorporate them more into my diet but have never added them to a pie crust before. Genius! Oats are great in pie crusts! 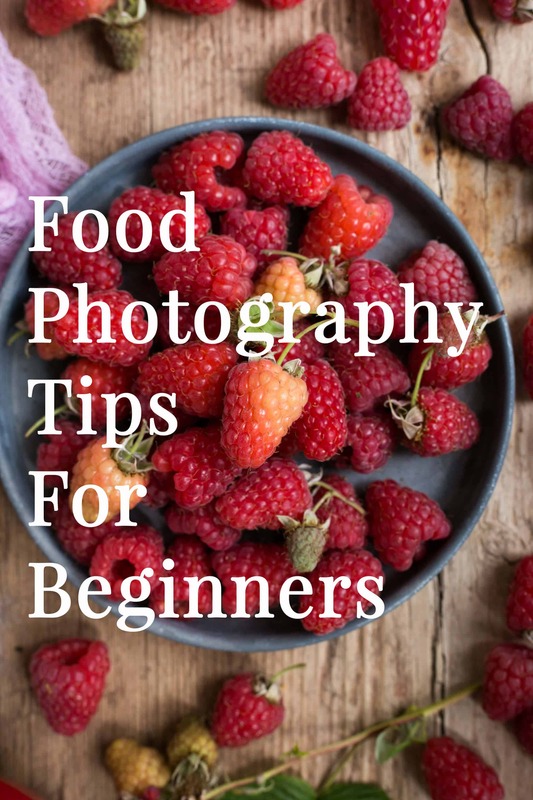 You can also process them in your food processor until fine texture and use it as an oat flour for baking (in addition with your plain flour). Glad you like the recipe Dominique, let me know if you try it! How gorgeous and PERFECT for summertime! This would be a hit at any party!! This tart is so beautiful! I’m also so excited that it’s a no-bake dessert because it is HOT where I live right now. You may just have given me the perfect excuse to invite some friends over for a barbecue this weekend and have them try this tart for dessert. Haha, glad I could help Daniela! I hope you and your friends will like it! This is seriously such a pretty tart. I look forward to peaches every summer and this is the perfect way to use them! Thank you Jenni! 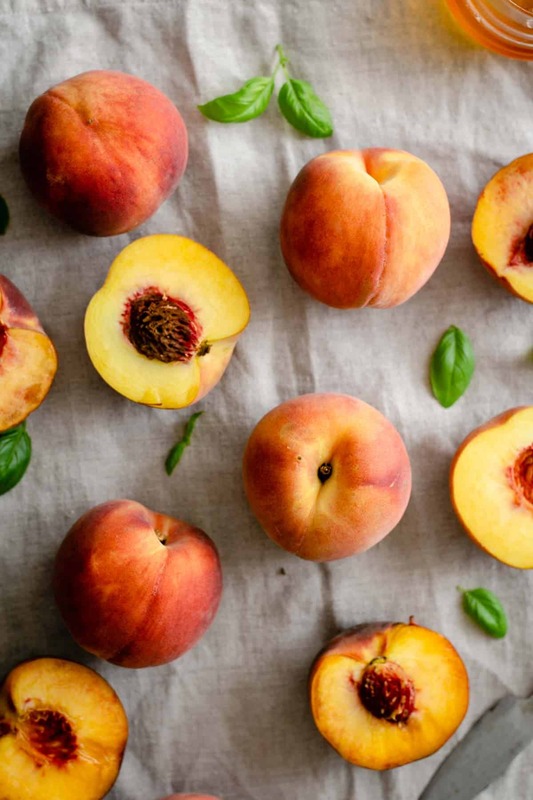 Peaches are one of my favourite stone fruits, and they will always remind me of summer! Glad you like the recipe! great presentation of the food! I agree, not the season for the oven, so your tart is perfect for August. Thank you so much David! And yeah, no-bake is the way to go in the summer! I love peaches this time of year. 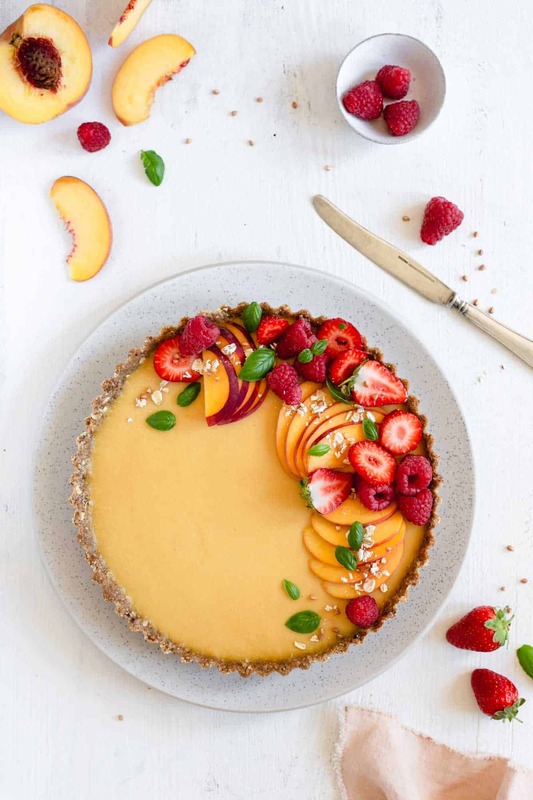 This tart is perfect for celebrating summer really. Looks absolutely delicious and so colorful and bright. Thank you Natalie, glad you like it! Hope you will give it a try sometime! This is THE prettiest tart that I have ever seen. I had a slow start to peach season with not many good peaches but have had more luck lately. THIS IS HAPPENING! hey Lorie! Happy to hear you like it! And so jealous, I would love to have my own peach tree! 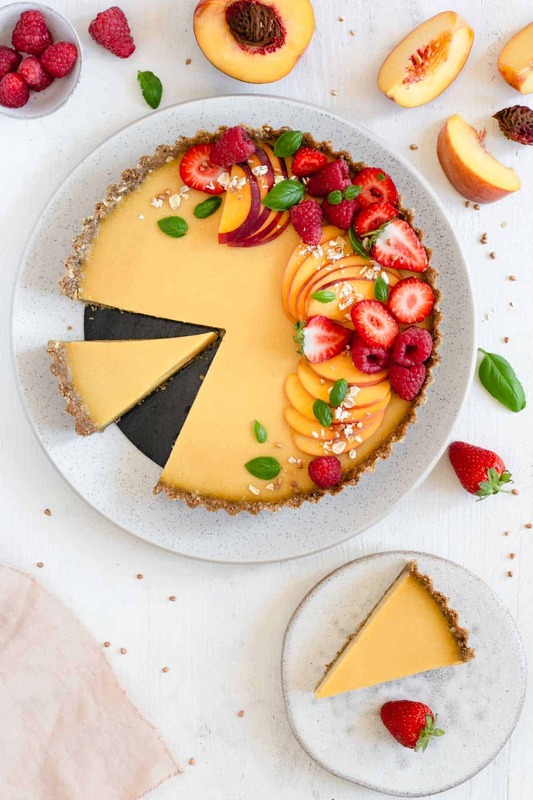 I just recently bought my first tart pan, but I only dream of making something as gorgeous as this tart! This is seriously magazine worthy. Yum! Absolutely gorgeous! Love how easy this is and what a super refreshing dessert for summer! Thanks Heather, there is definitely no sweat breaking manoeuvres with this one! Glad you like it! Are you using basil as a garnish? Yes, I’m using basil as garnish, hope this helps! This looks beautiful. Although, I am not a fan of dates, can this be done without dates? Hello there! Thanks so much! I’m honestly not sure what dates could be substituted for, as I have not tried doing so. They add texture and sweetness to the base, and also hold everything together nicely, making it sticky and easy to work with. Perhaps raisins could do the job too? This was sooo delicious but…mine didn’t set…hoping you can help me to work out why! I couldn’t find any ripe peaches so used mango. The consistency of the fruit seems similar so I don’t think it was that (I used an amount equivalent to the peaches)… I didn’t heat the mix for long (was only slightly warm) – it was fairly runny. Should it have been thick when I took it off the heat? Would the heat have thickened it if I’d left it on longer? I’ve used agar agar in raw cakes in the past, but have usually used 2 Tablespoons…hoping you can help! Hi Jasmine, thanks for your comment and for stopping by! The mixture for the filling should have been brought to boil, and at this point, it already should have thicker consistency, but it will thicken even more during cooling down. Cornflour and agar are both acting as bonding and thickening agents and both are required to achieve the desired consistency. Hope this helps, but let me know if you have any other questions! no problem at all! Let me know how did you get on with your second attempt Jasmine!